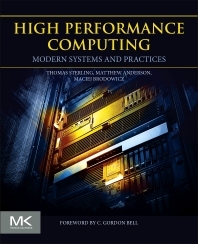 High Performance Computing: Modern Systems and Practices is a fully comprehensive and easily accessible treatment of high performance computing, covering fundamental concepts and essential knowledge while also providing key skills training. With this book, domain scientists will learn how to use supercomputers as a key tool in their quest for new knowledge. In addition, practicing engineers will discover how supercomputers can employ HPC systems and methods to the design and simulation of innovative products, and students will begin their careers with an understanding of possible directions for future research and development in HPC. Those who maintain and administer commodity clusters will find this textbook provides essential coverage of not only what HPC systems do, but how they are used. Thomas Sterling is Professor of Informatics and Computing at Indiana University. He serves as the Executive Associate Director of the Center for Research in Extreme Scale Technologies (CREST) and as its Chief Scientist. He is most widely known for his pioneering work in commodity cluster computing as leader of the Beowulf Project for which he and colleagues were awarded the Gordon Bell Prize. Professor Sterling currently leads a team of researchers at IU to enable a new generation of extreme scale computing systems and applications. He is the co-author of six books and holds six patents. He has taught a graduate level course upon which this textbook will be heavily informed, five times. Matthew is Principal Software Research Engineer at the Center for Research in Extreme Scale Technologies (CREST) at Indiana University. Maciej Brodowicz is Advanced Parallel Computing Engineer at the Center for Research in Extreme Scale Technologies (CREST) at Indiana University. The book integrated a large set of knowledge that is absent from similar books. Also different from other books is the availability of chapters useful for people that is not from computer science. The part dedicated to algorithms is smaller than usual.